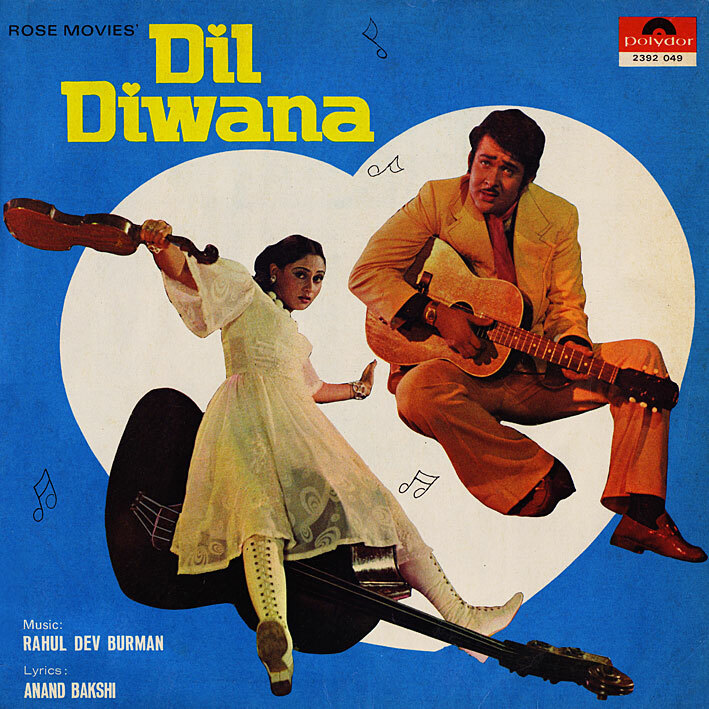 This 1974 effort is a companion piece of sorts to 'Jawani Diwani' from a couple of years earlier. Both films involve the same producer, director and lead actors, and there seem to be recurring characters... I'll let others either confirm or dismiss any direct thread between the two though. Because all that concerns us here is that both scores are by the same musical genius, and that the 'Dil Diwana' soundtrack is pretty much as good as its precursor. Essentially it's RD Burman at his prime, when he could pack a million different ideas into one song, and still make it sound coherent. And absolutely fabulous. 'Main Ladki Tu Ladka' is thus one of those songs that itself is worth a soundtrack's price of admission. But the rest is great too: 'Kisise Dosti Karlo' and 'Sun Nita Main Tere Pyar Ke Geet' are both lively and hummable Bollywood pop songs to get your toes tapping, and the sparsely arranged (RD knew restraint when required) 'Ja Re Ja Beimann' would be my favourite track on most other albums. So a top soundtrack through and through. Thanks for this excellent OST. Man, you are GOOD at reviewing these records! Thank you. I worry that I'm repeating myself a lot, so I appreciate that. That's what worries you? How often did Burman, Lahiri, Kalyandji-Anandji et. al. repeat themselves out of necessity alone? I'll bet they had no more than two to three weeks to score any one film. That should be one worry NOT to have! Thanks for this and other uploads PC. Though this movie had some fabulous songs, it was not that big hit as Jawani Diwani. I'll second litlgrey's comment, great writeup! And I'll third you, PC, and Stephen D. on your favorite track from this album, #4. I remember reading somewhere a while back that the song was recorded with both singers in different chambers, with a script and visual cues on when to sing. Makes sense, I could imagine it would throw a singer off his/her game if someone else was lalala-ing the refrain nearby, LOL. Thank you PC for this gem. Jaa Re Jaa Beimaan is a masterpiece and has been one of my all-time favs since I saw the movie. The existing links still work. Oh, sure! Thanks a lot. Great as always PC, thanks. Fantastic music. I often wonder to what extent the movie directors and producers influenced/controlled the musical direction for these movies. I share your tastes, and find Burman's funk experimentation generally more interesting than the pop and traditional arrangements (though i love it all really). Maybe Burman would come up with amazing experimental ideas, and the director would say "No No that's too funky! No wah-wah guitar. I want an easy listening pop soundtrack! Make it blander!". Maybe the music directors aren't always responsible for the style of their own music! Any ideas on this good people? You bring up a good point, Jake. Producers, directors, and even film distributors do influence the music compositions in films - whether by rejecting tunes, suggesting songs to "copy", or forcing a particular lyricist or singer to be used. As the story goes, the director of Sholay heard Demis Roussos' "Say You Love Me" while visiting his brother in London, and asked R.D. Burman to make a song based on that, and even had the writers develop a scene to fit that song into the movie as well. Also, Burman did the score for an 1985 movie named Zabardast. There was one really experimental number on that soundtrack which was released on audio, but in the film the director/producer wanted something more commercial and suggested rehashing a song by Genesis (I think) which was then picturized in the film but not included on the audio recordings. As far as using a different singer goes, the film Kudrat (by R.D. as well) provides such an example: the title song was recorded using one singer, but the director/distributors wanted a more saleable singer to perform this song. So in the albums you hear C. Gadgil singing to a different, more mysterious, and edgier tune, and in the movie you hear M. Rafi with more subdued and traditional sounding music.